It’s been about 5 days since I’ve seen Rogue One: A Star Wars Story, and since then I’ve been thinking about it constantly. Last year, we saw the return of the franchise to the big screen with The Force Awakens, which to me felt like new life being breathed into it that was lost during the prequel trilogy. Rogue One is trying something new by telling a story that takes place between two of the main episodes instead of continuing the main story. This left me feeling kind of skeptical and a little nervous that it wouldn’t pack the kind of punch that I expect from a Star Wars movie. As the credits began to roll and I left the theater, I was ready to sit down and watch it again. Jyn Erso (Felicity Jones) has been labeled a criminal by the Empire after breaking their laws and giving them trouble time and again. She has every reason to have such animosity towards them because when she was young she saw the villainous Orson Krennic (Ben Mendelsohn) tear her family apart when he forced her father, Galen (Mads Mikkelsen), to come with him to help develop a new superweapon for the Empire. Years later, Jyn is recruited by the Rebel Alliance for a very important and secret mission to obtain a secret message sent by Galen through a defecting Empire pilot, Rook (Riz Ahmed). Jyn, along with Rebel intelligence officer Cassian Andor (Diego Luna), his droid K-2SO (Alan Tudyk), a blind warrior Chirrut Îmwe (Donnie Yen), and mercenary Baze Malbus (Jiang Wen), begins her adventure to find this message, rescue her father, and stop the Empire from unleashing its new superweapon, the Death Star. Rogue One introduces a lot of new characters to the Star Wars universe, but it also introduces a new director to helm the project, Gareth Edwards. Edwards got his recognition with his 2010 independent film Monsters and went on to direct the 2014 American version of Godzilla, which people had differing opinions on. 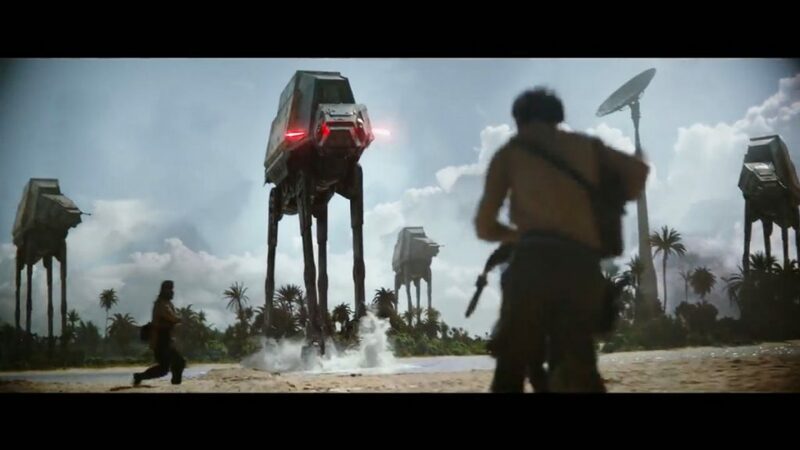 Either way, it’s safe to say he is a fantastic visual director, and this vision is one of the best parts of Rogue One. This is easily the most beautiful Star Wars film ever made with a unique blend of CGI, location shooting, and practical make up and effects. There’s so many beautiful scenes that show how great Edwards is with size and scale. From the AT-ATs coming through the fog to the Star Destroyer hovering over a city to that jaw dropping shot of the Death Star coming out of hyperspace. This is just such a beautifully crafted film in terms of its visuals and its sound and I give Gareth Edwards a lot of credit for creating a very unique looking Star Wars film. With all of this praise I’m throwing at Rogue One for its impressive style and beautiful cinematography, I have to also say that this is not a perfect movie and there are some flaws that are more apparent than others. The first 20-30 minutes of this movie are really rocky and often times confusing. We see Jyn’s backstory first, but after that we are forced to bounce back and forth between multiple different planets to introduce a plethora of characters really quickly. This feels messy and it’s hard to remember a lot of these characters this fast. As they are more established later on it was fine, but the first part of this movie was so scattershot. While Jyn and the rest of her crew are come pretty cool characters, only a few of them really get the attention that they deserve. Jyn gets plenty, but someone like Baze and Rook get next to nothing. It sometimes felt that these characters were pushed a bit too far into the background for a movie that is based on a team of heroes. Finally, there are a few CGI effects that happen for a certain character that is kind of weird. I understand and appreciate what they were trying to do, and on some levels it’s pretty cool, but it’s also really distracting to look at. So while this movie does have faults, it’s still a really entertaining movie that stands alone as well as acting as a springboard for the original trilogy. It combines lore deeply engraved in the Star Wars universe while also giving us all these new characters and ways of seeing characters we already know. The story takes us to all these different planets, each with their own feel and design. Star Wars has been known for its many different planets, and Rogue One uses its settings really well. When I say that this movie stands alone, I mean that it feels like a very different kind of movie in this franchise. This is a war movie with just a little bit of mysticism in the rare times that the Force is mentioned. There’s something about how this story is told that often times gave me goosebumps. It just feels like such a perfect fit into a universe that we all know and love. Rogue One: A Star Wars Story is a great addition to the franchise and it really is a relief to say that. This is a beautifully crafted film that looks, sounds, and feels very unique while also fitting into the established universe very well. There’s some weird pacing issues and not all of the CGI choices work as smoothly as the film makers seemed to think they did, but all of that is overshadowed by how much fun I had watching this movie. 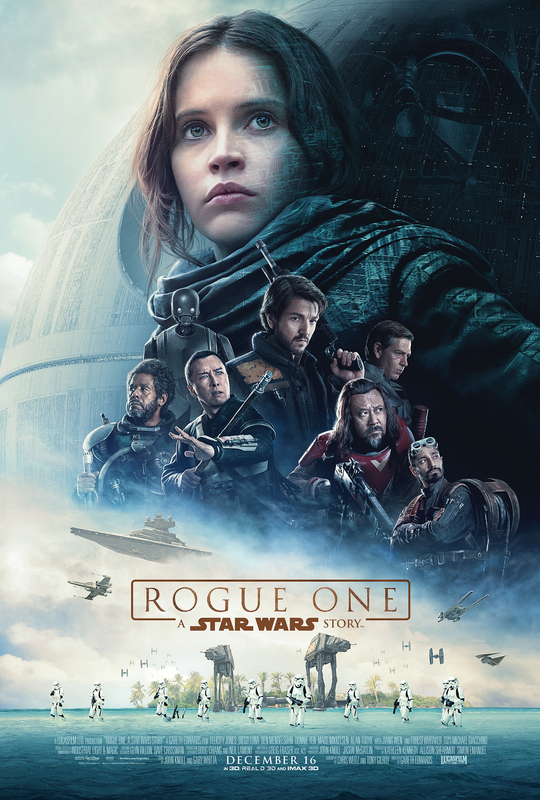 If you want to go into this movie and nit pick it so much that nothing is left of it, then go right ahead, but if you are a Star Wars fan and are ready for another trip to a galaxy far, far away, then brace yourself for Rogue One.